Escalator questions are very similar to the upstream and downstream questions. In a stream, the direction of flow of water is constant whereas, the escalators move in both directions. Escalator questions can be confusing as sometimes, questions might not explicitly reveal the direction in which the escalator is moving. Think of the river as your stairs and the length of the river as the length of the stairs, the only difference is that in river we measure it in terms of KM/Meters and in escalators we measure it in terms of number of steps. If you’re moving ‘with’ the escalator, you’d have to climb less steps on your own because the escalator also will ‘push you forward’ some number of steps on its own. For example, if you climb 70 stairs on your own, and escalator pushes out 30 stairs in your favor in the same time, you’d have climbed 100 stairs in total. If you’re moving ‘against’ the escalator, you’d have to climb more steps on your own because the escalator will try to ‘pull you back’ some number of steps on its own. For example, if you climb 70 stairs on your own, and escalator pushes out 30 stairs against you in the same time, you’d have climbed 40 stairs in total. Note: As the distance(length of the escalator) is constant, the three speeds i.e. x + y, x, x – y will be in arithmetic progression. Now, since time is inversely proportional to speed, the time taken in each case will be in harmonic progression. It should also be noted that escalator questions might include two different types i.e. when 1 person is moving and when 2 persons are moving. 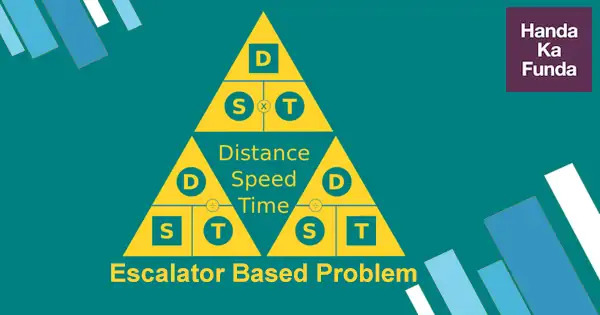 Question 1 on Escalator based problems: Anand takes 90 secs to move up an escalator which is moving downward and he takes 30 secs to move down the same escalator. How much time will he take to go up or down, when the escalator is switched off? Question 2 on Escalator based problems: When Ramu walks down, he takes 1 minute on an escalator which is moving down but takes 40 seconds when he runs down. He takes 20 steps when he is walking whereas he takes 30 steps when he is running. Calculate the total number of steps in the escalator? Assume the speed of the escalator to be “a” steps per second. As it is an escalator, distance covered by Ramu will always be same whether he is running or walking. Here, 60a is covered by the escalator. Again, 40a is the distance covered by the escalator. So, total number of steps will be = 20 + 60 (0.5) = 50 steps. Question 3 on Escalator based problems: P and Q walk up a moving up escalator at constant speeds. For every 5 steps that P takes Q takes 3 steps. How many steps would each have to climb when the escalator is switched off, given that P takes 50 and Q takes 40 steps to climb up the moving up escalator respectively? Question 4 on Escalator based problems::A can take 10 steps per second and B can take 7 steps per second. A mischievously starts climbing down an escalator that is moving upwards and at the same instant B starts climbing up the same escalator. They meet after 5 seconds. If the escalator works at a steady rate of 4 steps per second then how many steps are visible when the escalator is stopped? Question 5 on Escalator based problems: Saquib is climbing on a moving escalator that is going up and takes 30 steps to reach the top. Atreya on the other hand is coming down on the same escalator. For every 5 steps that Atreya takes, Saquib takes only 3 steps. Both of them take the same amount of time to reach the other end. Difference in the number of steps = 25 – 15 = 10 steps. Question 6 on Escalator based problems: Ravi takes 40 seconds to walk up on an escalator which is moving upwards but he takes 60 seconds to walk up on an escalator which is moving downwards. How much time will he take to walk up if the escalator is not moving? This is exactly like a boats and streams problem, and we are given the times taken by a person rowing downstream and upstream. Let us assume that the speed of Ravi is ‘r’ and the speed of the escalator is ‘x’. In the first case, when the escalator is moving up, Ravi’s effective speed is r + x as the motion of the escalator is assisting his movement. In the second case, when the escalator is moving down, Ravi’s effective speed is ‘r – x’ as the motion of the escalator is a hindrance to his movement. When the escalator is not moving, his speed would be ‘r’. The distance covered in each case is constant. The three speeds ‘r + x’, ‘r’ and ‘r – x’ are in an Arithmetic Progression. => The times taken will be in a Harmonic Progression. => Time taken when the escalator is not moving will be the Harmonic mean of the other two times given. => Time taken when escalator is not moving = 2*40*60/(40+60) = 48 seconds. Question 7 on Escalator based problems: Ravi takes 60 seconds on an escalator which is moving down when he walks down but takes 40 seconds when he runs down. He takes 20 steps when he walking whereas he takes 30 steps when he is running. What is the total number of steps in the escalator? Let us say that the speed of the escalator is ‘x’ steps per second. Distance covered by Ravi is the same whether he is walking or running. Question 8 on Escalator based problems: Ravi and Rakesh are climbing on a moving escalator that is going up. Ravi takes 10 seconds to reach the top but Rakesh takes 8 seconds to reach the top. This happens because Rakesh is faster than Ravi. Rakesh takes 4 steps whereas Ravi can take only 3 steps in one second. What is the total number of steps in the escalator? This question can be interpreted as two people rowing a boat downstream. Let us assume that the escalator moves at the rate of x steps per second. Another variation of this problem could be if we were not given the times taken by Rakesh and Ravi but the number of steps that they took to reach the top. Let us look at that problem. Question 9 on Escalator based problems: Ravi and Rakesh are climbing on a moving escalator that is going up. Ravi takes 30 steps to reach the top whereas Rakesh takes 32 steps for the same. This happens because Rakesh is faster than Ravi. Rakesh takes 4 steps whereas Ravi can take only 3 steps in one second. What is the total number of steps in the escalator? Before moving ahead, please notice the difference between previous question and this one. The first thing that we will do is to figure out the time taken by Rakesh and Ravi to reach the top. Rakesh takes 32/4 = 8 seconds whereas Ravi takes 30/3 = 10 seconds. From now on, everything is same as the previous problem. Let us assume that the escalator is moving with a speed of x steps per second. A slightly more difficult version would be when we do not know the speeds of Rakesh and Ravi but only the ratio. Let us look at that in the next problem. Question 10 on Escalator based problems: Ravi and Rakesh are climbing on a moving escalator that is going up. Ravi takes 30 steps to reach the top whereas Rakesh takes 32 steps for the same. This happens because Rakesh is faster than Ravi. For every 4 steps that Rakesh takes, Ravi takes only 3 steps. What is the total number of steps in the escalator? If you notice the difference between the previous question and this one, the problem is that now we don’t have a definite amount of time taken so we have to solve this by ratios. Another variation of this type of problem could be when we are given the steps by only one person and they are moving in opposite directions. Let us look at that. Question 11 on Escalator based problems: Ravi is climbing on a moving escalator that is going up and takes 30 steps to reach the top. Rakesh on the other hand is coming down on the same escalator. For every 5 steps that Rakesh takes, Ravi takes only 3 steps. Both of them take the same amount of time to reach the other end. The extra information in this question is “Both of them take the same amount of time to reach the other end” and that is really the key to solving this question. Ravi has taken 30 steps in the full journey, whereas Rakesh has taken 30*(5/3) = 50 steps. The difference in the number of steps in full journey = 50 – 30 = 20 steps. The difference in the number of steps when they cross each other, which is exactly half of the journey = 20 / 2 = 10 steps. These were the basic concepts for Escalator based problems which will help you to tackle the related questions in CAT.